In 2016, ECOP was identified by the International Labour Organization as one of its implementing partners in its project entitled “Building A Generation of Safe and Healthy Workers or the SafeYouth@Work Project”. The project recognizes the importance of enhancing national capacities to monitor and enforce OSH laws and regulations, particularly those relevant to young workers. It is in this regard that the International Labour Office (ILO) SafeYouth@Work Project, in collaboration with the International Training Centre of the ILO (ILO-ITC), and the Ministry of Labour, Invalids and Social Affairs of Viet Nam (MOLISA), organized a “Sub -Regional Training Course on National Strategies to Ensure OSH for Young Workers”. The sub-regional course equips national OSH stakeholders and other relevant partners on methods, strategies and good practice tools to plan, develop and, manage efforts on improving national OSH systems. The course is designed for tripartite participants, with a particular focus on good practice strategies and tools to effectively protects the workplace safety and health of young persons aged 15-24. The training course is designed for policy makers, senior officials and advisers from government institutions responsible for planning, implementation and management of OSH at the national level; and workers’ and employers’ representatives involved in development and implementation of OSH policies at national, sectoral and enterprise level, and youth organizations. ECOP sees this new undertaking as a good opportunity not just to scale up its existing OSH program but also develop and strengthen the capacity of its chapters to deliver OSH related program and services among its members. 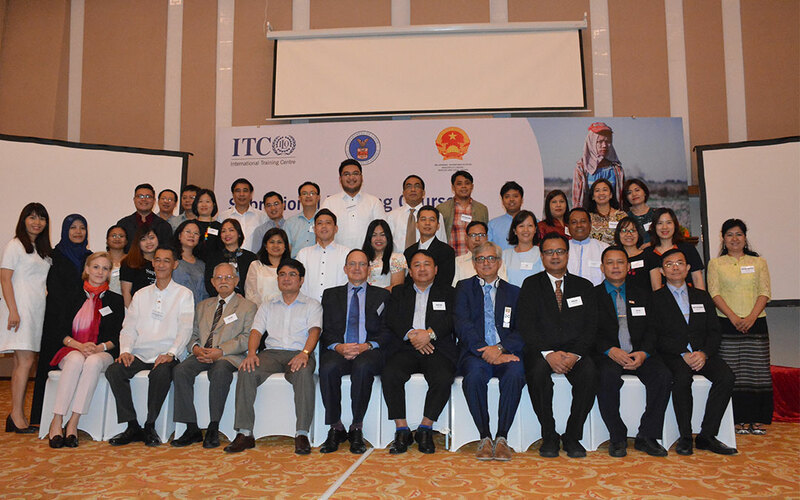 Government, employers’, workers’, and youth representatives from Myanmar, Philippines, Indonesia and Viet Nam attended the training course. ECOP was represented in the training course by Ms. Rhodora Snyder, Manager of ECOP CSR Department, and Mr. Neil Orillaneda, ECOP Regional Affairs Coordinator . To know more about ECOP’s implementation of this project, you may contact Mr. Neil Don Orillaneda, ECOP Regional Affairs Coordinator, at neilorillaneda.ecop@gmail.com or at +639173026926.